Stealth Mushroom Controllers and Systems. 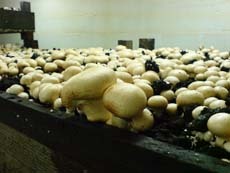 The Series 2000 Mushroom Controller is designed for the controlling the growing conditions of mushroom sheds. Operating the Heating, Cooling, and Humidifying, dehumidifying, Varying Circulation fans, Varying Fresh Air fans and modulating the Louver opening and closing. Fully compatible with heat pump systems. 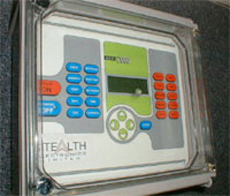 Microprocessor control means that the unit is also highly flexible. Designed and manufactured in the UK to meet your requirements of reliability and quality ensuring a long and trouble free service. 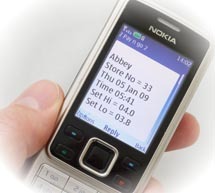 Using the latest GSM technology - text messages are sent directly to your mobile phone to confirm the stores conditions or alert you to possible forth comming problems. 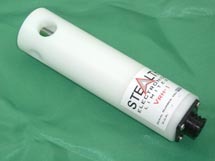 This control available allows for Spawn run, case run, breaking, growing, growing and drying and inter flush programs. The complete life cycle of mushrooms growing programs. Fully interfacing to CO2 meters, up to 10off compost probes, ambient sensors, Air temperature sensors together with either Electronic RH% or aspirated screen RH% inputs. 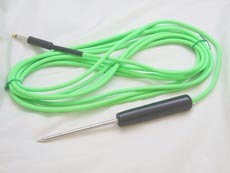 The compost probes are manufactures in stainless steel and provide robust and reliable temperature sensing. Electrical connections are provided via a 8way relaycard. Each relay is supplied with an operating LED with fused outputs and manual override switching facilities. Relays rates at 10 amp and fused at 5 amp. The Series 2000 can be networked to a PC computer. 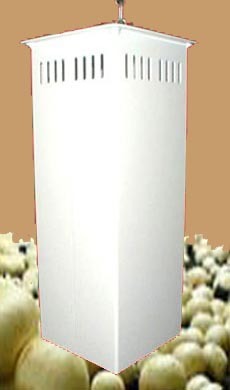 This is useful on medium to large mushroom farms. 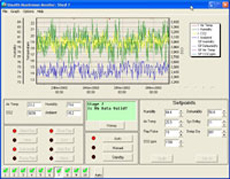 From the PC set points can be adjusted and for data logging. The Windows based user-friendly program allows the operator to investigate and track the sheds performance. All readings can be displayed and printed in multi colour traces. 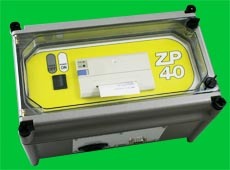 Alternately, the ZP-40 serial printer can be connected directly to the Series 2000 Mushroom Controller. 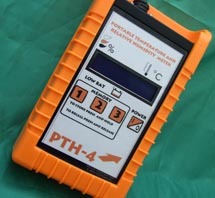 High Quality and accurracy temperature and humidity handheld readout PTH-4 available with a selection of different probes and lengths to suit your application. Aspirated Screen RH% are also available.